This is my day three in Dubai and today we prepared Bakery style ‘Egg bread toast’ for evening tea. My sister’s son ‘Kunjoos‘ liked it very well. Here is the recipe about its preparation. 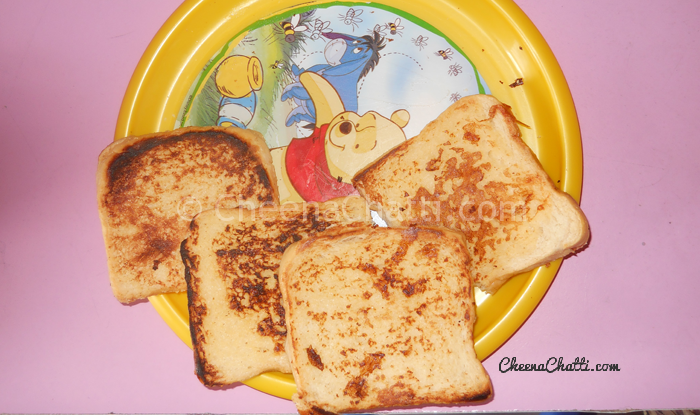 Try this bread toast for your kids and let me know your comments. Break eggs into a wide, shallow bowl or pie plate one at a time and beat lightly with a fork. Add boiled milk and sugar to it and blend it into a batter. Heat a large skillet or griddle. When the skillet is hot, add 1 table spoon of butter. Cover each slice of bread with batter using a spoon and keep it for 30 seconds. Place onto skillet or griddle and cook until golden brown on each side. Continue cooking remaining slices of bread. You may need to add more butter to the skillet or griddle, if needed. Serve with butter, powdered sugar or syrup. It will taste better if you use wine bread. Try our other egg recipes too. This entry was added on March 5th, 2013 by Renoos in Bakery and tagged with egg, snacks, bread toast, bakery, breads, how to make bread toast, evening snack. Last revised on April 4th, 2018.